Website testing jobs are one of the interesting, simple online jobs to earn money. Working on user testing jobs website doesn’t require any coding skills. All you need is a PC, smartphone and some basic skills to start testing websites and apps for money. Unlike most of the boring online freelance work, app testing jobs will be fun to do and take not more than a few minutes to complete. Start testing websites, apps & products from home at your own convenient timing to earn more than $10 per successful test completion. In this article, you will be learning what is website testing jobs, why they pay for testing websites & mobile apps and find the list of best user testing job sites. So, what is online website testing jobs? Here is all you need to know about user websites jobs. This work is not about testing the technical elements of the websites and does not require any skills in website or app building languages like HTML, CSS, JS, Jquery, PHP. In this case, the testers need basic to advanced skills in browsing websites, using apps and good communication skills to get hired. If you’re looking for technical website testing, check out the digital marketing jobs. You could have already guessed from the name “User testing jobs” that this work is about testing the User experience of the website or an app. Speaking about the user experience, every product and service in the world need to be convincing for the users i.e. customers. Companies spend millions of dollars to test and improve their products & services as per the users’ taste. This job exactly belongs to the same category. To be precise, website testing job is testing the user experience of the websites and the same applies to mobile apps called mobile testing jobs. Speaking about user experience, it is one of the most important factors for the websites and apps. When a user or a customer enters a website, he must be able to fulfill his purpose. User experience is about how easier the user can able to use the website or the app. 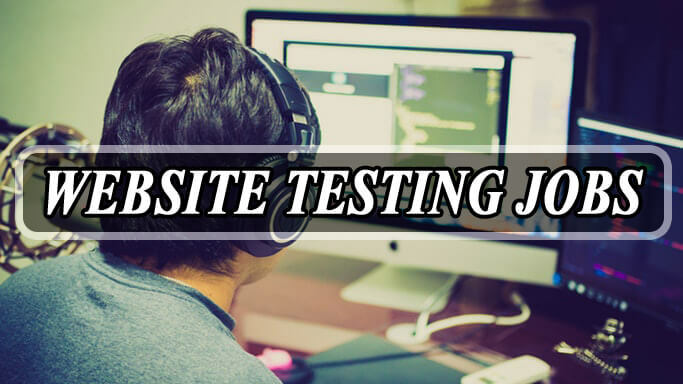 In this job, the tester will be given with a set of instructions to test a website or an app before it is made available for the customers. The tester has to follow the given instructions and record his comments while testing the website. High-end testing requires the testers to self-record live video while testing the website. And it’s not a mandatory option to use cams in micro jobs sites. Here is an example for website testing job to make you understand more clearly. Everybody shop online and if you don’t, feel free to check how to earn money shopping online. The sites we use to shop online are called e-commerce websites. Let’s take Amazon.com as an example. Amazon.com sells almost all the products in the world. Their job is to list the products that online shoppers are looking for, add the product(s) to the cart, process the order & payments(if applicable) and deliver the product to the given address. Taking it as an example, when a new e-commerce site is created, it will not be directly launched for the customer services. Instead, it has to be tested to remove bugs(technical) and tested to find the usability(user testing). In the case of user testing, the tester will be asked to find a product on the website and complete the purchase, The tester has to start recording the video while he makes a test purchase. Based on the instructions given, the tester has to find the suggested product(s) and complete the checkout process. Be advised that this is a simple example and the actual test process might vary. So, why the e-commerce sites do the testing? The testing data will be used to analyze the usability of the website like time took to complete the shopping, the heatmap of user browsing, steps used to search the product(s), applying coupon codes, usage of payment options etc. The e-commerce website will not be tested by one tester, but multiple testers will repeat the same test. The results will be used to improve the user experience of the website like the ease of finding the product(s), checking offers & discounts, completing payments and other important factors in shopping online. Hope you would have got an idea about how to do user testing. You’ve seen a real-time example for testing the e-commerce website(s) and testing the e-commerce mobile apps will be little different. Testing other websites like selling online courses, blogs, software downloads, travel websites, streaming video & music, matchmaking, dating apps, gaming, will have own set of testing steps. Now you’re ready to become an online website tester. Check out the requirements to become a tester. A PC or Mac or Laptop. Android smartphone or iPhone(applicable for app testing if not using the simulator). A webcam(applicable if asked to record videos). An earphone with Mic(applicable if asked to record voice). Good communication skills(applicable if asked to record voice). The UserTesting is the best website to earn money testing websites and apps. UserTesting was one of the pioneers of usability testing industry, helped top companies all over the world to test their applications. They excel in assisting marketers to improve their conversion rate, testing mobile apps, games, UX, e-commerce, rating designs & infrastructure etc. UserTesting has strict onboarding process for the testers since they are working with elite clients. Only the skilled people will get a chance to become a tester on UserTesting. Usually, the opening will be very limited, so it is advised to check the availability as often as possible. Once, the application is submitted, the tester will be asked to submit a sample video. The tester must clearly articulate their thoughts in order to get their account approved. 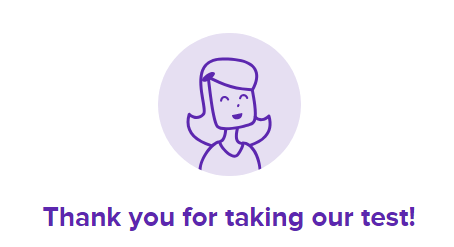 Once the onboarding process is complete, the tester will be notified via email and user dashboard whenever new test opportunities are available for them. The tester should complete the testing process to get paid. UserTesting pays $10 per test. On average, it would take up to 20 minutes to complete the test. Currently, UserTesting is hiring tester from Asian countries like India, middle east countries, almost all the countries from N. America & S. America, Europe, selected countries from Africa. The tester must be able to receive payment using verified PayPal. All the Payments are made on NET 7 basis. 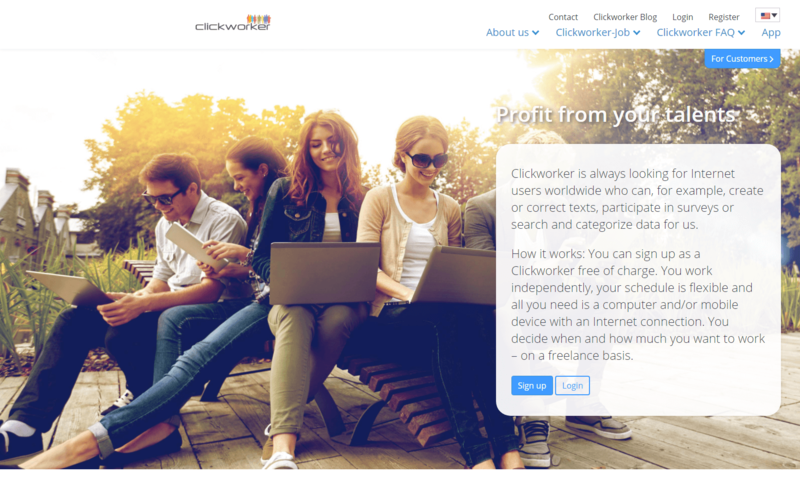 The Clickworker is a Micro jobs website that offers the online jobs to internet users to earn money. Clickworker employers publish simple tasks called micro jobs for the workers. The workers should complete the Micro Jobs in order to earn money. Clickworkers can earn from a cent to a few dollars by completing the tasks. The tasks posted on Clickworker will be simple and easier, even the workers with little to no skills get chances to earn money. Clickworker has got a lot of employers posting Micro jobs related to website testing and app testing. To access the website testing tasks, the worker has to complete the assessment under the testing category. 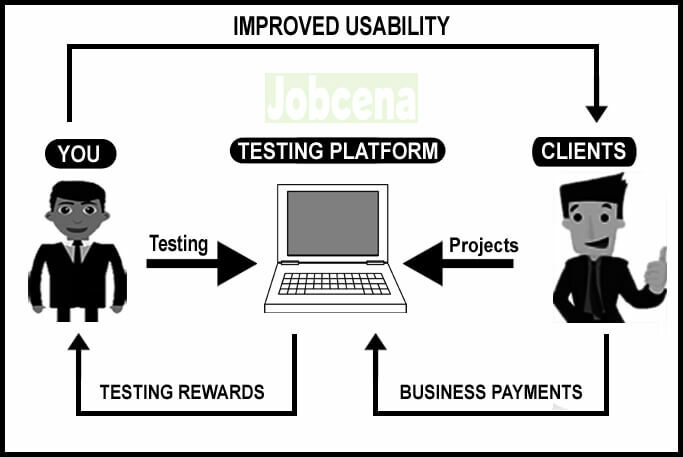 On passing the simple assessment the worker can start earning money by completing the website testing tasks. Clickworker is open to members from all parts of the world. There is no approval process. The workers have to sign up and verify their account to access the Worker dashboard. If your application is not approved by Usertesting or if you’re looking for an alternative, join ClickWorker. UserTest.io is a beginner friendly website testing company owned by UserConversion Ltd based in Manchester, England. 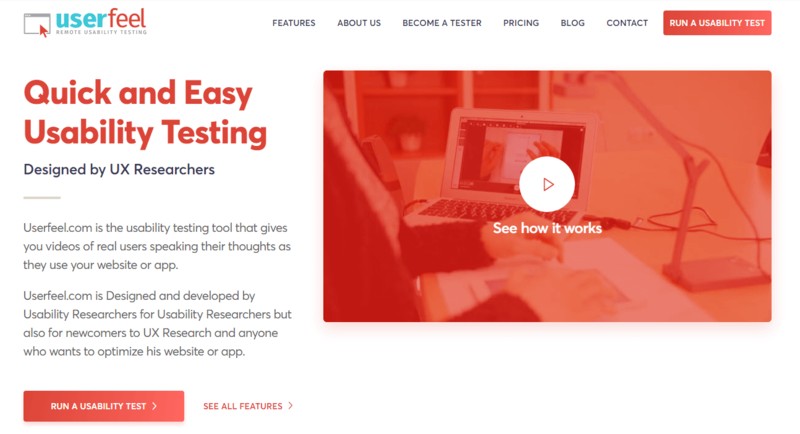 While other usability testing job provider sites are complex and confusing, UserTest.io has made their service very simple both for the clients and the tester. No prior experience needed to work on UserTest. Once the signing up process completes, the tester should download their software to the PC or Mac. The software will be used to record the screen and the voice of the tester. The new users should sign up and complete a sample test to become a tester on UserTest.io. Pick up the available tasks in free time and complete it to earn $10 / £8 per test. UserTest.io will send the payments within 2 days after completing the test through PayPal. 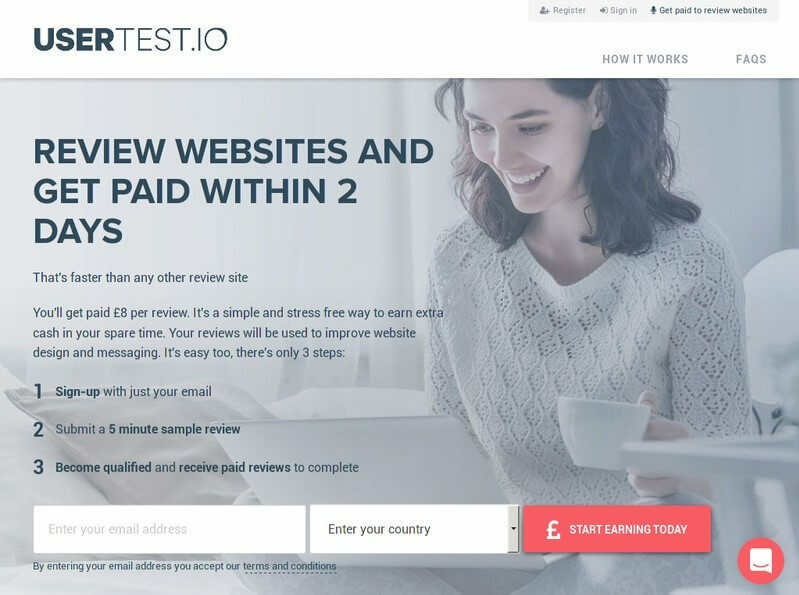 UserTest accepts reviewers from Asia Pacific, America, Europe and Africa. Become a quality assurance professional on Tester work to earn money by testing apps from companies like Evernote, Microsoft, Facebook, Spotify. If you’re a QA professional already or if you’re looking to start your career as a QA professional, join the Tester Work to access QA resources and gain experience by testing amazing apps. To get approved by Tester Worker, you must pass a short QA test. Then work on their projects at your own convenient timing. Unlike the website testing sites mentioned above, Tester Work has got a higher number of projects from different industries. Choose the one that you’re interested and get paid to find bugs. Apart from earning money by testing apps, Tester Work is the place to gain exposure in the tester world. Tester worker organizes an event called Testathon® every year. Tester workers get first access to the exclusive events. So, if you want to become a recognized website tester, this is the company for you. The tester receives payments directly via PayPal and freelancers get paid through Upwork™ contract after two weeks from the test cycle completion. Userfeel is one of the established research platform work on testing usability of Websites, apps, prototypes. Since 2005, Userfeel has worked with top companies in the world like Rakuten, Schneider to increase the profitability of the applications using their multilingual testing tool. The best thing about Userfeel is, it supports over 40 languages. So, if you’re not a native English speaker, feel comfortable to apply for the testing job on Userfeel. To become a tester on Userfeel, you must apply for the job filling the detailed application form including native. This will help the application reviewer to assist according to the profile. The new testers must take the qualification test in order to verify the availability of the microphone and to get rated. One thing that makes Userfeel unique is their screenout process. To ensure good testing quality and hassle-free testing, Userfeel will screen the testers based before taking the tests. So, only relevant tests projects are made available. Testers can use any device including Smartphone, tablet, PC, laptop to test the website and apps. Userfeel pay flat $10 for completing a test. Testers can withdraw their testing rewards to the PayPal account or Amazon gift cards. Enroll app is one of the oldest websites in the testing industry started in 1998. 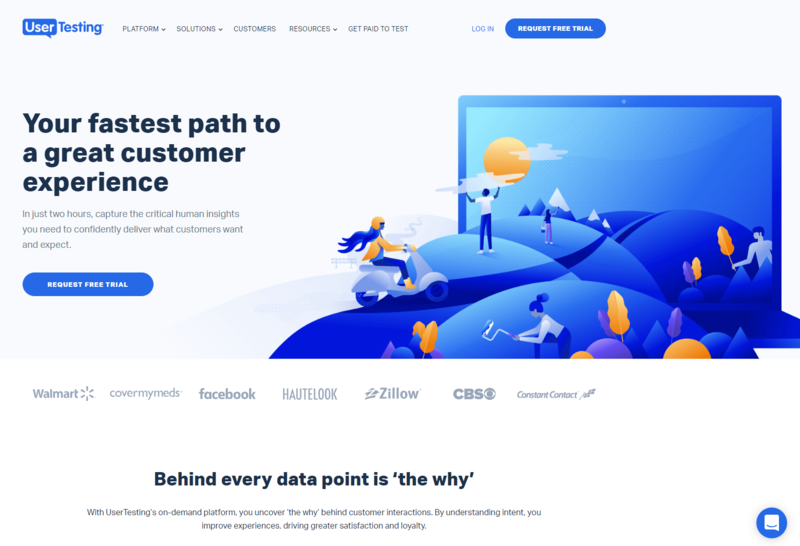 Run by ZURB the product design company working on websites, apps, software, and other integrated services, Enroll remains part of it to help make the internet a better place. 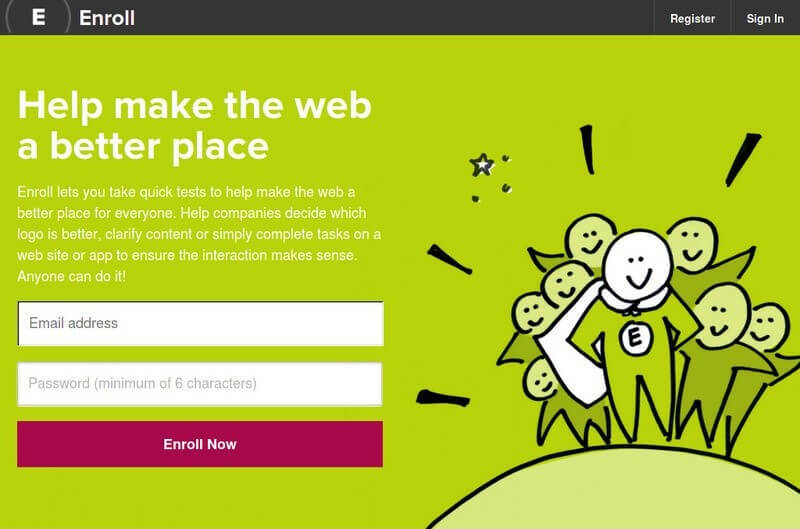 The internet users can join the Enroll community to earn money completing simple tasks related to user testing. Join Enroll take the sample test to learn how to work on tasks. Complete tasks to get compensated for each test via PayPal. Earn money using phones, tablets or desktop whichever you feel comfortable. Here is a simple example of website testing job sample on Enroll. 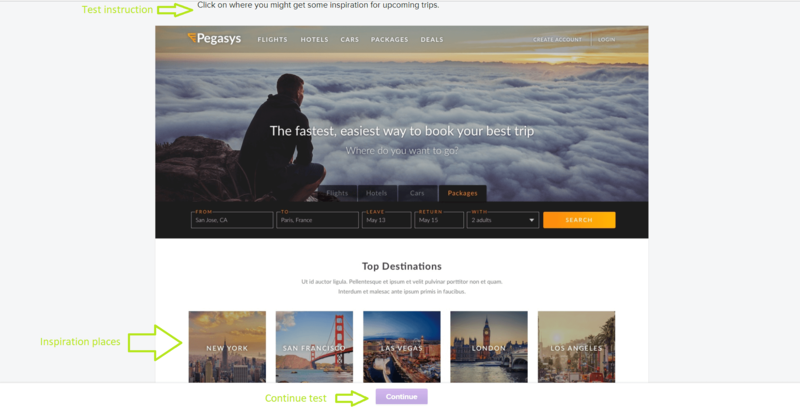 In this test, the travel website is tested. Earlier you would have read testing the e-commerce website. But here it is different where the tester must carefully follow the given instructions based on travel services. In the first step, the tester was asked to find some inspiration for upcoming trips. In this case, the tester must browse the webpage to find the interesting trip(s). During the process, the heat map will be recorded to find how quickly and how easily the user can able to find the destinations. In the second step, the tester was asked to review the feel of the webpage. The third step was to explain in brief what made the user feel based on the selection. This is just a sample test. The data given by the tester and the automated analysis will help the travel website to improve their services by making it user-friendly, trustworthiness. In the case of advanced tests, the tester must give voice comments as they carry on with the test. 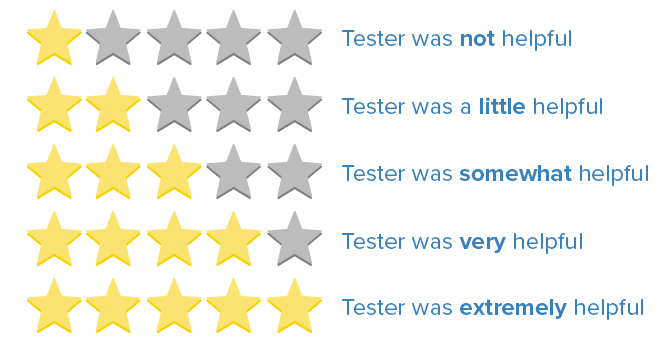 Like in freelance jobs, it is really important for the tester to maintain their five stars rating to enjoy additional benefits. Clients prefer to choose the tester with the highest rating to test their websites. And the user testing websites’ automated algorithm first invites the testers with a high rating to take the website testing job. Testers with five starts rating will have higher confidence compared to the underrated testers. Get a chance to become the reviewer, top testers might get a chance to work directly as the company employee in the limited number of sites. Few sites award badges and certificates for participating in events on behalf of their company, these opportunities will mostly stick with the elite testers. To get five-star ratings to concentrate more, give some unique comments instead of just giving a general opinion. Stand out of the crowd to earn more and be a top rated tester. Website testing job is a legitimate way to make money online. One of the simplest and interesting online jobs. Earning $10 or more within a few minutes without technical skills is possible only in user testing. Professional QA tester gets a chance to join the tester community. Get paid via PayPal and gift cards. Work using any device including smartphones and tablets. Great job for people who like to comment on products. Getting approved by a user testing site will be a concern for people with fewer communication skills. Reviews might get rejected by the clients. Not a reliable online job for part-time testers. One of the main purposes of testing web apps is to improve the conversions rate just by altering simple factors in the website based on the user experience. More conversions mean more customers. More customers mean more money. The heatmap of user testing helps the clients to detect which part of the website gets higher engagement. Using this factor, the most important elements can be moved to the red area. Sites which are selling products or service can make the checkout process easier based on the testing review. Professional testers are used to find the bugs in the website and apps before launching them for the users. Remove unwanted elements from the page that has no use to improve speed and user experience. Reduce expense and improve ROI. Since only fewer tests will be available in a user testing websites like the data entry sites, it is recommended to apply for the website testing jobs in multiple websites to get more test invitation and more money.